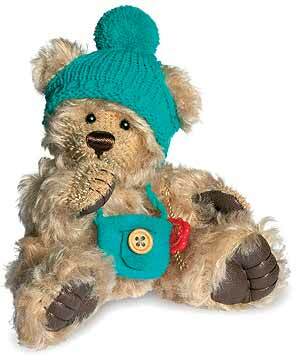 Teddy Hermann Tom Thumb Bear, is fully jointed and made of the finest beige Mohair. Tom Thumb, as his name suggests, can place his thumb in his mouth. he wears a knitted hat with pom pom and also has a little felt bag around his body. Limited edition of only 500 pieces worldwide. Item number 150794, safety eyes, synthetic filling, mohair material is surface washable only. non growler, Size 18cm tall.